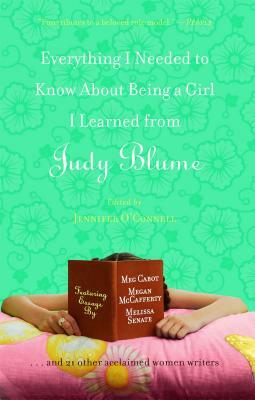 "I wonder if Judy Blume really knows how many girls' lives she affected. I wonder if she knows that at least one of her books made a grown woman finally feel like she'd been a normal girl all along..."
Whether laughing to tears reading Otherwise Known as Sheila the Great or clamoring for more unmistakable "me too!" moments in Are You There God? It's Me, Margaret, girls all over the world have been touched by Judy Blume's poignant coming-of-age stories. Now, in this anthology of essays, twenty-four notable female authors write straight from the heart about the unforgettable novels that left an indelible mark on their childhoods and still influence them today. After growing up from Tales of a Fourth Grade Nothing into Smart Women, these writers pay tribute, through their reflections and most cherished memories, to one of the most beloved authors of all time. Jennifer O'Connell received her BA from Smith College and her MBA from the University of Chicago. She is the author of Insider Dating, Bachelorette #1, Dress Rehearsal, Off the Record, and Plan B. Visit her website at www.jenniferoconnell.com. Meg Cabot is the author of the #1 New York Times best-sellers All-American Girl and The Princess Diaries series, two of which have been made into major motion pictures by Disney. Meg is also the author of The Mediator series, the Airhead series, and many books for adults. She currently divides her time between Key West and New York City with her husband and one-eyed cat, Henrietta. Beth Kendrick won the Romance Writers of America's Golden Heart Award for My Favorite Mistake. She has a Ph.D. in psychology and an unshakable devotion to the Chicago Cubs. After surviving too many Minnesota winters, she moved to Arizona, where she is working on her second novel (coming soon from Downtown Press). For more information you can visit the author's website at www.bethkendrick.com. Cara Lockwood is also the author of I Do (But I Don't), which was made into a Lifetime movie, as well as Pink Slip Party and Dixieland Sushi, and Every Demon Has His Day, all available from Downtown Press. She was born in Dallas, Texas, and earned a Bachelor's degree in English from the University of Pennsylvania. She has worked as a journalist in Austin, and is now married and living in Chicago. Her husband is not a rock star, but he does play the guitar -- poorly. Laura Caldwell, a former trial lawyer, is currently a professor and Distinguished Scholar in Residence at Loyola University Chicago School of Law. She is the author of eleven novels and one non-fiction book. She is a nation-wide speaker and the founder of Life After Innocence, which helps innocent people begin their lives again after being wrongfully imprisoned. Laura has been published in thirteen languages and over twenty countries. To learn more, please visit www.lauracaldwell.com. Melissa Senate is the author of eight novels, including the bestselling See Jane Date, which was made into an ABC Family TV movie and has sold over 200,000 copies worldwide. She's published short pieces in Everything I've Always Wanted to Know About Being a Girl I Learned from Judy Blume, It's a Wonderful Lie, Flirting with Pride and Prejudice, and American Girls About Town. A former romance and young adult editor from New York, she now lives on the southern coast of Maine with her son. Kayla Perrin has been writing since the age of thirteen. She is a USA TODAY and Essence bestselling author of dozens of mainstream and romance novels and has been recognized for her talent, including twice winning Romance Writers of America’s Top Ten Favorite Books of the Year Award. She has also won the Career Achievement Award for multicultural romance from RT Book Reviews. Kayla lives with her daughter in Ontario, Canada. Visit her at www.KaylaPerrin.com. Kyra Davis is the New York Times bestselling author of Just One Night, “Just Once More”, Just One Lie, the Pure Sin series, the Sophie Katz mystery series, and the novel So Much for My Happy Ending. Now a full-time author and television writer, Kyra lives in the Los Angeles area with her husband, son, their leopard gecko, and their lovably quirky Labrador, Sophie Dogz. To learn more, visit KyraDavis.com or follow her on Twitter @_KyraDavis and Facebook.com/AuthorKyraDavis. Elise Juska's short stories have appeared in many magazines, including The Hudson Review, Harvard Review, Salmagundi, Black Warrior Review, Calyx, and The Seattle Review. She teaches fiction writing at The New School in New York City and The University of the Arts in Philadelphia. Her first novel, Getting Over Jack Wagner, is available from Downtown Press. Visit the author's website: www.elisejuska.com.